There are lots of different home addition options out there, which can be overwhelming for homeowners looking to begin a home renovation. How much space do you need to add? What type of addition suits your needs? Where do you even begin? Start by learning about the pros and cons to home addition options. Knowing what your options are will help you to decide which one is right for your home. Some home additions are very simple, and only require expanding an existing room. This type of addition is common for creating full bathrooms, a bigger bedroom, or expanding a kitchen. Pros: This is the simplest and least invasive addition option. The process is usually knocking out a single wall and building outward from there. Because it is such a small addition, it costs less than any other addition type, making it a good solution if money and space are both tight. Cons: This is a single-room solution. If you need a lot more space in your home, it will not fit your needs. On top of that, the cost of a bump out addition may be misleading. It is less expensive than the other addition types, but actually costs more per square foot. This is because of additional costs associated with building, such as acquiring the correct permits and expanding your foundation. You would have to get this information no matter what type of addition you do, so you don’t save that cost when you make a smaller addition. When a bump out isn’t big enough, but you don’t want to add an entire apartment, a single room addition might fit your needs. 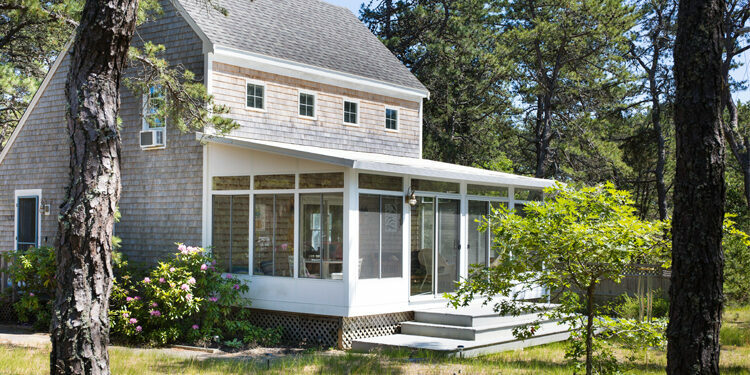 This type of addition might be a sun room, porch, or garage. Pros: If you need some space, a single room addition allows you to create the room you’ve been missing. A sun room will allow you to spend some time with nature year-round, while an extra bedroom can accommodate a growing family. A single room gives you the space and functionality you need without taking up a lot of space. Because it is relatively small, it is also fairly inexpensive. Cons: A single room may not provide the amount of space you’ve been looking for. They are also typically attached to the side or back of the home, taking up space in the yard. If you don’t have enough property, or you don’t want to give up room to play outside, a single room addition may not fit your needs. This is probably the most common addition type. Homeowners who want more space in the home can build out the side, back, or even front of their home. Pros: Flexibility! Building outwards gives you lots of options. Need more space than a single room? Build several rooms or an in-law apartment. This type of addition also gives you a lot of artistic freedom, especially if you’re expanding the back of your home. It can’t be seen from the street, so it’s the perfect place to add a little bit of your own private design flair! Cons: Unless you plan on building into your neighbor’s yard (please don’t), this type of addition is bound by your property lines. You’ll also need to take city regulations into account; you may not be able to build to the edges of your property. If you don’t have the space for outward expansion, this addition may not be for you. If outward expansion won’t work or doesn’t fit your needs, consider a second-floor addition to a single story home. Pros: Space is a big pro for this type of addition. While outward additions can certainly cover a lot of ground, they are bound by property lines and zoning restrictions. Adding a second floor nearly doubles your home’s square footage! On top of that, you won’t sacrifice any space in your yard! Cons: Adding a second story requires adding stairs, which take up a lot of space. It will also involve a lot of work to the existing structure of your home. Adding on top of what is already there requires work to ensure adequate support. A contractor will need to add supports to your existing walls, ceiling, and sections of your foundation. No matter what type of addition suits your home renovation needs, you should work with a general contracting company you can trust. Mason Sky has extensive experience with building home additions. We would be happy to work with you to decide what type of addition is right for your home. Request your free consultation today.